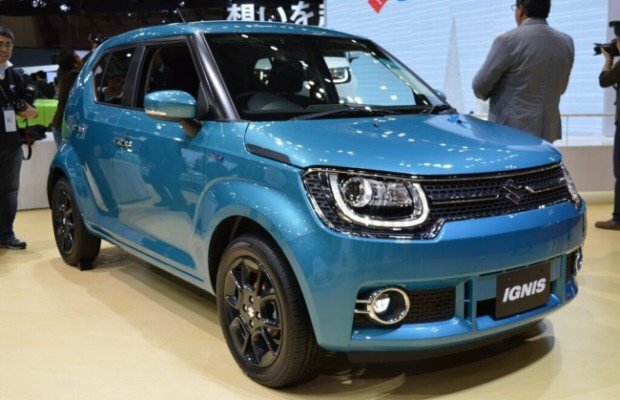 In the month of August we reported that Maruti Suzuki’s upcoming compact SUV shall be called as Maruti Ignis ( whose renderings was shared during the Geneva motor show) – today, the news is confirmed as the car was officially revealed during the Tokyo Motor show that was held on October 28. You can see the actual images of Maruti Ignis in this article. The car which is a compact cross-over is a IM-4 concept was revealed on last Geneva Motor show. One can clearly notice the large headlamps that are integrated to front grille and SUV-like bonnet. The car gets 18-inch alloy wheels and flared up wheel arches. In the Europe, the all new Maruti Ignis is going to directly compete against the Fiat Panda 4×4 and the car is going to be powered by a 1.2-litre DualJet petrol as well as 1.0-litre BoosterJet petrol engines. The all new Maruti Ignis is going to be manufactured and exported to Europe from the Maruti’s plant in India. Maruti will be bringing the all new Ignis sometime in the year 2016. The Maruti Ignis will be tweaked according to Indian conditions. Maruti Ignis shall also feature their popular SHVS or Smart Hybrid Vehicle by Suzuki, which was recently seen in cars like Maruti Ciaz and Ertiga.